Well, the I Wish You a Merry QAL is coming to a close and I thought I'd recap it a bit. First, thanks to everyone that participated! The other designers and I are overwhelmed by your creativity and perseverance. For many of you, the blocks required skills that you'd never used before. But like the wonderful quilters you are, you pushed through the challenges and created beauty. Thanks also to my fellow designers. Wow, you humbled me not only with your gorgeous inventive designs, but also with the way we worked so well together. I look forward to our next quilt along! The final linkup will close today at midnight (specifically, January 15th @ 11:59 PM EST). 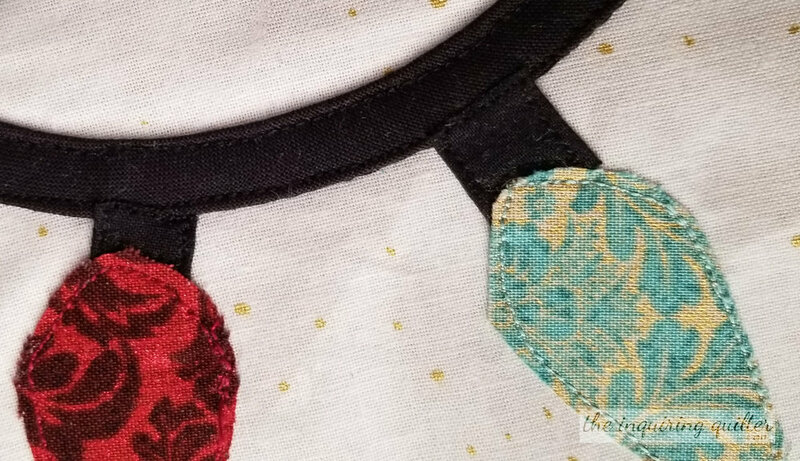 If you haven't already, try, try to get your quilt top done so you can post it to the linky, Facebook, or Instagram and enter our final giveaway which is so huge it overwhelms me. I mean, look at all these prizes! The blocks were together, but I still needed to add borders and letters to the center block. Well, then Christmas happened and it got busy at the quilt shop and so I didn't get back to finishing up my top. On Sunday, I decided to add the lettering. To do that, I typed the letters I wanted into Word, and played around with various fonts. I decided I liked the look of Impact, a sans-serif font. Next, I played with the size of the letters then printed out the result and tried it out on my actual quilt. I also auditioned fabrics, deciding on a mostly solid piece from the collection. After I decided the letters look okay, I flipped them over and traced them on fusible. I prefer Heat n Bond Lite. Next, I fused the back of the fabric and cut out the letters. To keep things orderly, I arranged the letters on this handy tray that my good friend Susie recently gave me. I really love it--I can put the pieces of a block in the tray and move back and forth to my ironing board without messing anything up. Thanks Susie! I used a ruler to arrange the letters on the center block and to keep them straight. After fusing the letters, I edge-stitched them using a matching thread. I haven't added borders to my quilt top yet, but I plan to soon. Quilting though will have to wait as my big sewing machine is in the hospital. Crossing fingers that I get it back soon, all well and working good. Stay tuned for an announcement coming soon about our next quilt along--fall themed this time! Thanks again everyone, and don't forget to post your quilt top photo by midnight tonight! You can follow me on social media or sign up for my newsletter if you’d like to watch me finish my quilt. You’ll find all the ways to follow me at the top of my sidebar. If you have any general questions about the quilt along or would like to where you can download the patterns, click the I Wish You a Merry QAL tab above. The patterns may not be available after midnight tonight (it's up to the individual designer), so be sure to get them now if you want them. Welcome to the final linky party for the I Wish You a Merry QAL! By now you've gotten all 12 block patterns and have made or are making all your blocks. Now it's time to think about how to sew all these blocks together! Obviously, the simplest and easiest way is to simply sew them into rows like Setting Example 1. Since there are 12 blocks, it makes sense to use four rows of three blocks each. Borders are optional of course, but I like the look of a skinny inner border and a wide outer border for this. Another simple way to finish the blocks is to set them in rows, separated by sashing strips. You can add cornerstones if you like, like shown in Setting Example 2. Fancy things up a bit by piecing your sashing strips! Need a bigger quilt? The easiest way to accomplish that is to add an alternate block like the one shown in Setting Example 4. How about a star block? They sure fit the Christmas theme! What do you think? Don't forget to play with color! Sometimes it's the colors that throw us off when comparing setting ideas. How about setting the blocks on the diagonal, using easy HSTs to separate them? This is the setting I had originally planned for my blocks. Here's another variation of the diagonal setting, playing with the colors vertically. In the end, I decided to go with a medallion setting using quarter-square triangles. In this version, I put a QST in the center as well. In the end though I went with a plain block in the center. I plan on appliquing the words "I Wish You a Merry Quilt Along" on the center block. Here's my quilt top right now. I still need to add borders and the applique but she's looking pretty good! Well that's it! I can't see what you do with your blocks. When you're done sewing them together, take a photo of your quilt top and post it here in the linky below to enter to win the grand prize! This time, we hosts are sharing the linky party! Yep, no matter which blog you post your photo on, it'll appear on all of the host's blogs! Won't it be so cool to see a big gallery of everyone's quilts? I can't wait to see what you guys do! 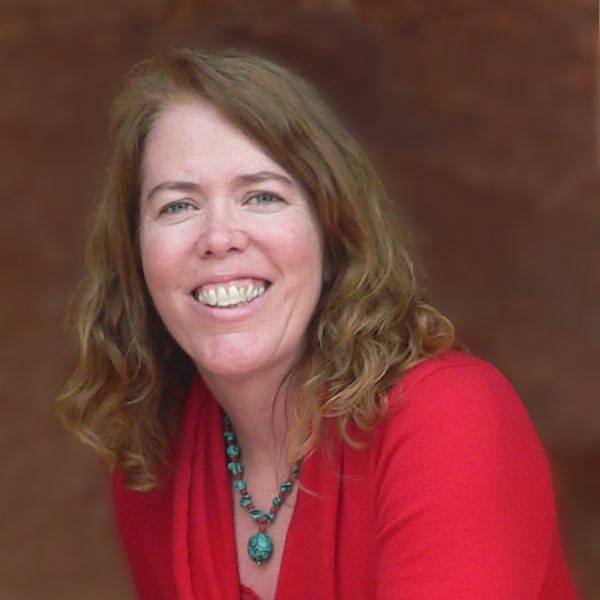 Be sure to drop by the other host's blogs to see what setting choices they've explored. When you're done, be sure to come back to link up! Wait! I've got a special announcement! Thanks you guys for a wonderful quilt along! I have really enjoyed your creativity and your enthusiasm! Great news! My fellow designers and I are excited to announce that we will be doing a Fall themed quilt along in 2018! We're still ironing out the details, but we'll let you know more soon. As soon as I know, you will too! Be sure to follow my blog, watch for announcements in the Facebook group, or on Instagram with the hashtag #iwishyouamerryqal. Be sure to enter the final giveaway! After you complete your quilt top, post a photo of it online by 11:59 PM January 15th, 2018 to enter our grand prize drawing. Yeah, yeah it's the holidays, but just take a gander at what you might win! To be eligible to win the grand prize, you must post a photo of your completed quilt top (that includes all 12 blocks in the quilt along) by 11:59 PM EST January 15, 2018. Your top doesn't need to be quilted to enter for the grand prize, but it must include one of every block in the quilt along. To the linky below. If you need help linking up, click the Wednesday Wait Loss tab above. It'll give you detailed steps on how to upload a photo to a linky party. You can follow me on social media or sign up for my newsletter if you’d like to watch me finish my quilt. You’ll find all the ways to follow me at the top of my sidebar. If you have any general questions about the quilt along or would like to see the complete schedule, click the I Wish You a Merry QAL tab above. 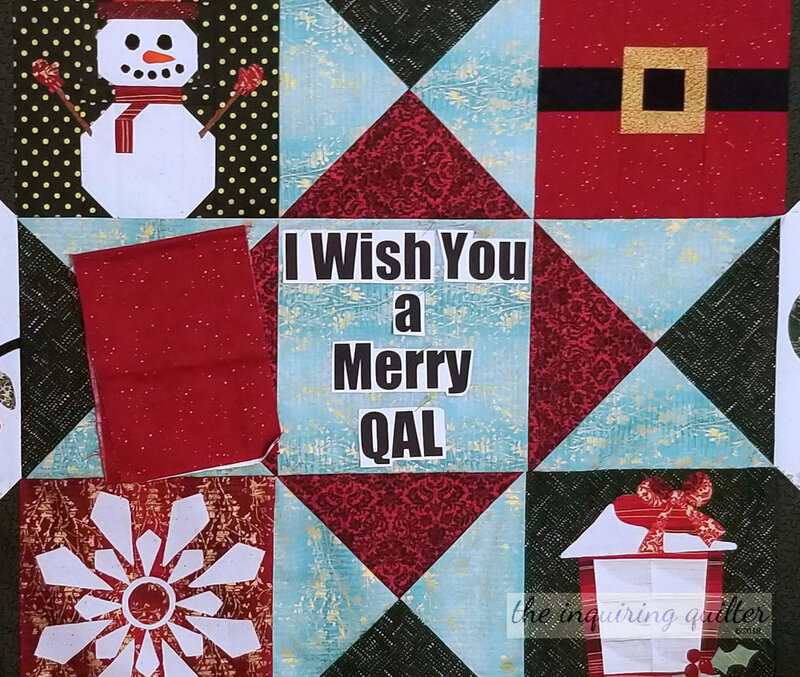 Welcome to final edition of the I Wish You a Merry QAL! Block 12 is here! Yep, that means all of the block patterns have been released! If you've just stumbled upon us, it's not too late! You can still download all the block patterns in our quilt along until midnight January 15th, and you've got about a month to make the blocks and sew them together in order our grand prize giveaway! Click here to learn more about the quilt along and the location of the patterns for blocks 1 to 11. Continue reading to find out more about Block 12 and how to enter both the block giveaway and the final grand prize giveaway. For my blocks, I’m using the Shiny Objects in Holiday Twinkle collection by flaurie & finch for RJR Fabrics. 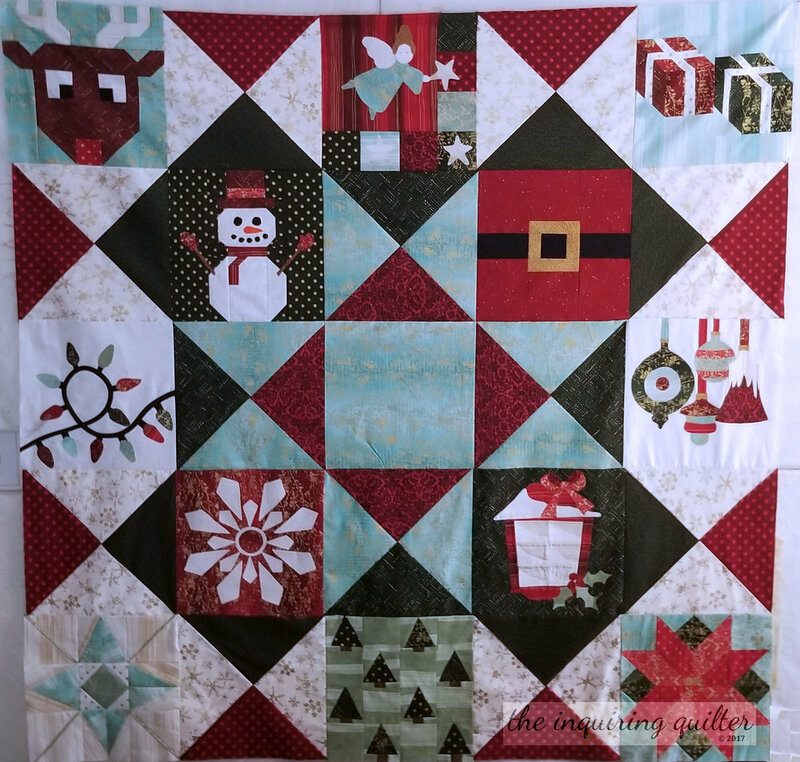 Block 12 (Christmas Lights) in our quilt along was designed by Laura @ Slice of Pi Quilts. Here’s my version of her block. This is such a great block! I took the opportunity to use as many of the fabrics from the Shiny Objects collection as possible. For the background of my block, I chose #2792-12 (Snow). For the lights I used #2792-13 (Cranberry), #3022-05 (Red Velvet), #3022-06 (Seafoam), #3022-07 (Tannenbaum), #3023-05 (Scarlet), #3023-07 (Crystal), #3023-08 (Pistachio), #3026-04 (Red Velvet), #3026-05 (Tannenbaum), #3163-03 (Crimson), #3163-05 (Seafoam), #3163-06 (Tannenbaum). As a QAL host, I’m here to help you achieve success with this block. First, since this block involves applique, you might want to cut your background larger and trim your block after completing your applique. I cut my background square 13". Now to start, you need to make black 1/2" bias tape, or buy some pre-made.I don't have a bias tape maker, so I kind of fudged my way through this. Let me tell you what I did. First, I cut my strips on the bias. 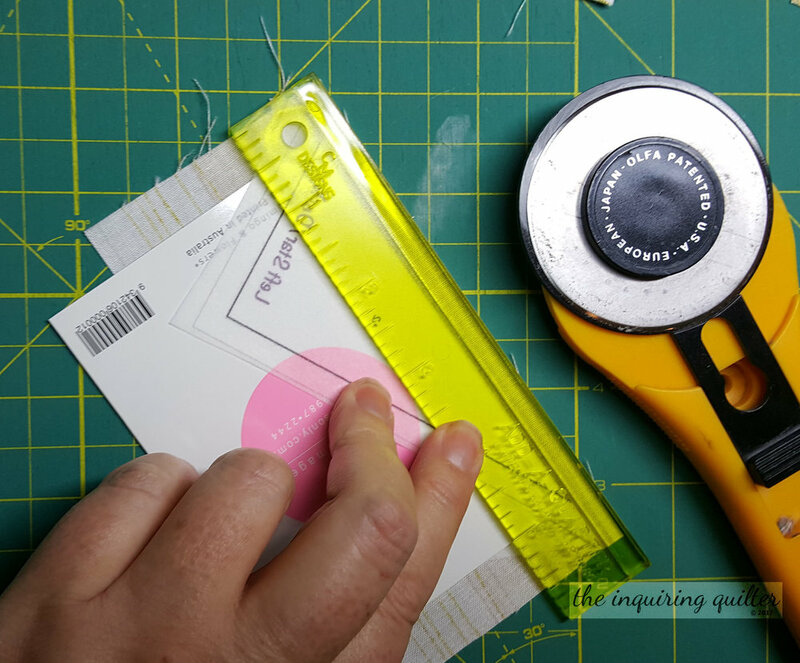 To do that, place your ruler's 45 degree line on the bottom edge of your fabric and make a cut. 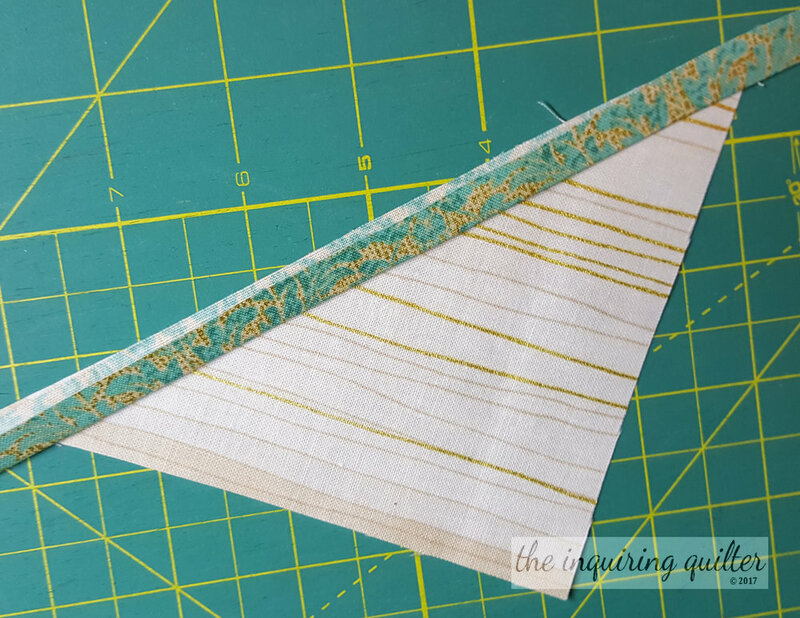 Turn the triangle around and measure 1" away from the cut edge and cut your bias strips. Based on the width of my fabric, I needed only two strips. Sew your strips together. Don't forget to line them up so you see dog ears on either side! Next, I tried pressing the both edges into the center of the strip.Doing that manually only kinda worked for me, so then I created my own bias tape maker by putting two pins in my ironing board and sliding the strip under that and pressing to fold the edges in. That didn't work easily for me either. I would swear I've used this method before to make bias tape, but this time all I got was frustrated. My strips were looking a bit worse for wear at this point (and so was I!) so I recut my strips, this time at 1-1/4". Not sure why I decided to cut my strips a bit larger, but I thought I might have better luck that way. Anyway, this time round I simply folded the strip in half and sewed it together. Then I pressed the seam under and voila! a nice bias strip. I laid the strip on my background and pressed it into place just like Laura said. Next, I stitched it in place, edge-stitching along both sides. For the bulb sockets, I cut my pieces 1" square instead of 1/2" so I could fold them under on the left and right sides. I would have tucked the ends under the bias stem at this point had I not stitched it down (did I mention I was fumbling my way through this? ), so instead I opted to just bump the raw edge of my sockets against the bias strip and stitch them down. Finally, I cut and fused my light bulbs, adding a few more than in the pattern because I wanted to feature as many fabrics as I could. I edge-stitched the bulbs with matching threads: Sulky 40 wt. #1272 (Hedge Green), Sulky Polylite #60 wt. #1104 (Pastel Yellow-Green), Signature 50 wt. #SN907 (Beryl Green), Cotton + Steel 50 wt. #1045 (Light Teal), Signature 50 wt. #278 (Cranapple), Wonderfil Konfetti 50 wt. KT302 (Christmas Red), and Sulky 40 wt. #1169 (Bayberry Red). After I edge-stitched all the appliques, I trimmed my finished block to 12-1/2". Woot! Done! Be sure to drop by Laura's blog to get your free block pattern. Also, don’t forget to visit the other quilt along hosts to see their versions of this block. To enter the Christmas Lights block giveaway, you must make the block and post it in one of these three places by Monday, December18th at 11:59 PM EST. If you post your Christmas Lights block by the deadline, you might win this wonderful prize package—a six month subscription to Make Modern magazine and a PDF pattern of your choice from Sandy @ Sandy Star Designs. If you like show and tell, I'd love it if you'd also share what you've been working on lately in my weekly Wednesday Wait Loss linky. We have a great group of quilters and the projects are inspiring! The atmosphere is so fun and encouraging. If you need a little incentive to join us, I'm having a giveaway so be sure to link up! The currently linky is open until midnight EST tonight, then on Wednesday, another linky starts. Don't leave me! I need ideas on how to put these blocks together! No problem! Click here to see my quilt top and to get more ideas on how to set your blocks together. After you complete your quilt top, post a photo of it online to enter our grand prize drawing. I know it's busy this time of year, but just look at what you could win! To be eligible to win the grand prize, you must post a photo of your completed quilt top that includes all 12 blocks in the quilt along by 11:59 PM EST January 15, 2018. Your top doesn't need to be quilted to enter for the grand prize, but it must include one of every block in the quilt along. 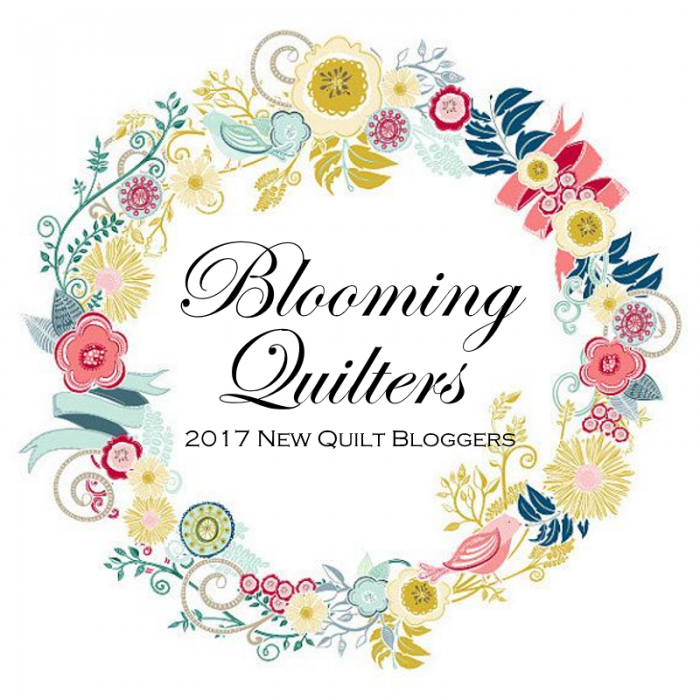 You can follow me on social media or sign up for my newsletter if you’d to see how I quilt my quilt. You’ll find all the ways to follow me at the top of my sidebar. If you have any general questions about the quilt along, click the I Wish You a Merry QAL tab above. Welcome to the I Wish You a Merry QAL! Block 11 is here! And after this, only one more block to go! Good thing, since around here the days are growing shorter and the temperatures are dropping. How are your blocks coming along? Here's what mine look like. Click here to learn more about the quilt along schedule and the location of the patterns for blocks 1 to 10. Continue reading to find out more about Block 11 and how to enter the block giveaway. 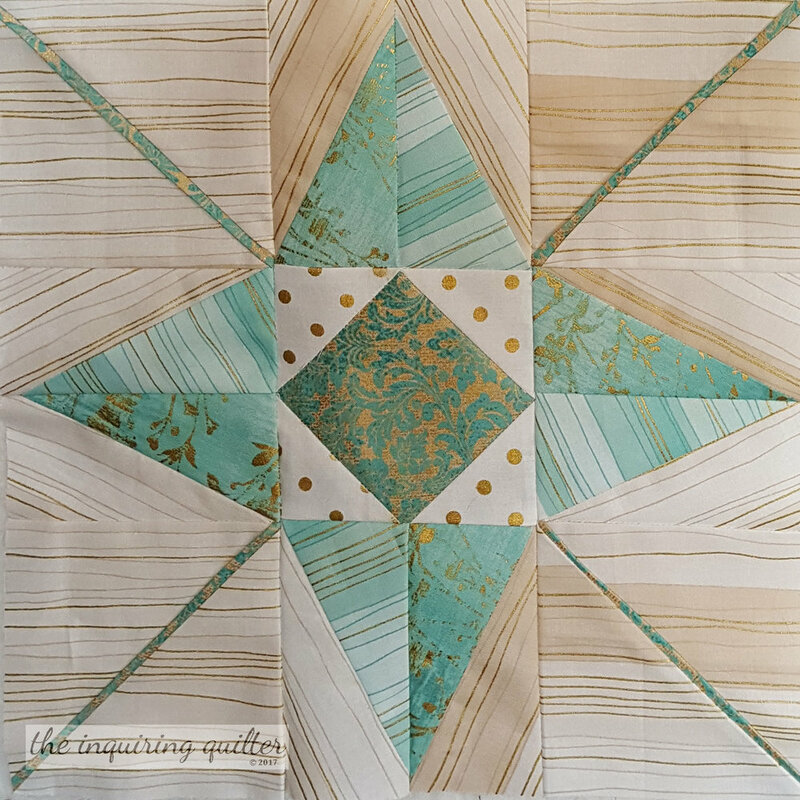 Block 11 (North Star) in our quilt along was designed by Kathleen @ Kathleen McMusing. Here’s my version. Isn't this a beautiful block? For the background of my block, I chose #3023-06 (Sugar). For the star I used #3022-06 (Seafoam), #3023-07 (Crystal), 3163-05 (Seafoam), and #3164-04 (Snow). As a QAL host, I’m here to help you achieve success with this block. Kathleen (clever girl) has provided several different ways for you to make this block. I chose paper-piecing. First though you must make the square in a square in the center of the block. Follow Kathleen's directions, and you'll be fine. When I use the sew-and-flip technique, I always mark the diagonal sewing line. This helps me to be more accurate, and with a square in square, accuracy is the key. After it's sewn, trim the square in square unit to 4-1/2". I made the star point units using paper piecing. Here's a quick tutorial to help you. For more help on paper piecing, click here. I decided to cut my star point fabrics 2-3/4" x 5-1/2" and not cut them in half diagonally as Kathleen directs. This just made sense to me although it probably uses more fabric. Anyway, to paper piece, lay the background rectangle face down, then lay the foundation (face up) on top of it. I try to place the line between A1 and A2 roughly 1/4" down from the edge of the background rectangle. I only have to eyeball it because the next step ensures an exact 1/4". Pin before moving onto step 2. You should make sure though that the A1 area fits inside the background rectangle. Next, I place a card on the line between A1 and A2, fold the foundation back over the card, and place my 1/4" marker on the card and trim. Next, I flip the foundation over, and lay the star point fabric on top of the background fabric, right sides together and matching that newly trimmed edge. Pin again, flip the foundation over to the right side and sew on the line. That's it! All that's left is to press and trim. When I trim, I measure 1/4" from the solid line on the foundation. The next block unit you need to sew are the rays. Follow Kathleen's directions and you should be just fine. Simply press the ray fabric in half, lay it along the edge of one of the background triangles, then lay another background triangle on top and sew. 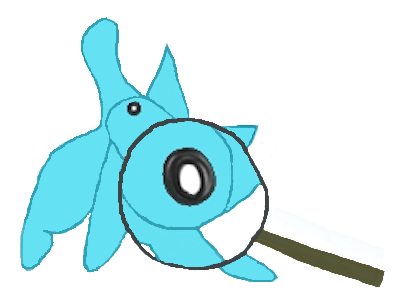 You can make the rays wider by cutting the ray fabric wider, such as 1" or even 1 1/4". I kept the foundation papers on my star point units until I'd sewn them into the block, but you can remove them if you want. I just find that leaving the foundations with their seam markings on helps ensure a perfectly sewn block. I pressed my seams open as Kathleen suggests. Be sure to drop by Kathleen’s blog to get your free block pattern. Also, don’t forget to visit the other quilt along hosts to see their versions of this block. To enter the Christmas Lantern block giveaway, you must make the block and post it in one of these three places by Monday, November 20th at 11:59 PM EST. If you post your North Star block by the deadline, you might win this wonderful prize package—a Binding Baby from Doohikey Designs and a PDF pattern of your choice from yours truly! Come back for the next block! On Tuesday, December 4th, be sure to come back here for the last block in our quilt along--Block 12! I'll also be showing you several ways you might finish your quilt. We have a fabulous grand prize package, and I encourage you to join us! There are many people who are catching up too so you'll have lots of company. If you need inspiration, I highly recommend our Facebook group. To be eligible to win the grand prize, you must post a completed quilt top that includes all 12 blocks by 11:59 PM EST January 15, 2018. Your top doesn't need to be quilted to enter for the grand prize, but it must include one of every block. Look at this incredible package of prizes--thread, fabric, batting, patterns and more! You can follow me on social media or sign up for my newsletter if you’d like a reminder when the next block is posted. You’ll find all the ways to follow me at the top of my sidebar. If you have any general questions about the quilt along or would like to see the complete schedule, click the I Wish You a Merry QAL tab above.